This book does not appear to have been a library book; however, it is of the time period (1966-1968) of the last few books I read. So there’s that. 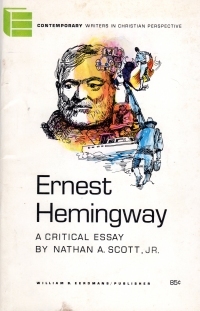 Like the 1959 booklet Ernest Hemingway, it’s a short pamphlet, targeted to college students perhaps, that discusses the work of Ernest Hemingway. This book is from a series called Contemporary Writers in Christian Perspective, so it has a little bit of that going on. There’s a short bio that captures the highlights of Hemingway: A child who liked the outdoors, a veteran(ish) of World War I, a newspaperman who lived in Paris and began his writing career there, and the time frame of his major works. Then this author describes a couple threads in Hemingway’s work, the ethics of the man living up to an ideal, the piety, the belief in the healing powers and almost sacred nature of, erm, nature. Then the author goes onto a little rant about people who find fault with Christians finding Christian themes in books that are not found in the Christian fiction section of the book store (well, that’s a contemporary thing, but you get the idea). Overall this author approves of the work of Hemingway, as do I. So I’m going to start saving up for those complete collections of Hemingway that cost thousands of dollars. All I need to do is forego book sales for the next two hundred years. No, it’s not a typo: The word in the title is really massage. This book is an ex-library book from El Camino Real High School. There’s not an El Camino Real High School nearby; as a matter of fact, the only one I found on the Internet is in Los Angeles. There might be another one in Arkansas or something (let’s face it, the Spanish Camino Real was akin to highway numbering/designation–in St. Louis, it’s known as Kingshighway still and encompassed part of Lemay Ferry Road). So, what do we have here? We have a mixed media style presentation where McLuhan continues to develop his theory of cognition and his errant philosophy of life in the digital age. As he spins his theory of how electronic media circa 1967 are altering brains and freeing the youth from the old, square ways of thinking, we get visual elements like like a series of close-ups of a foot with toenails zooming out throughout the book, repeated words making the prose into a concrete poem, and approximately six visible womens’ breasts in various images. Counting them makes me feel prudish, but this was a high school library book, and I’m hearkened back to a local controversy vis-a-vis Slaughterhouse Five. At any rate, I thought McLuhan gets some of his prognostications correct in how immersive electronic media would become (remember, he’s writing this before home computers, smart phones, and the Internet). He does understand a bit of how that will alter the thinking of youth–fifty years later, it has continued, but not beyond his imagination. Kids have the ability to do greater and greater mash-ups. But. Unfortunately, he suffers from a big bunch of Platonic thought in that he thinks the concepts described in electronic media are primary and more important than the things being described and conceptualized and seems to indicate that everything that happens (happenings, he calls them, in that sixties way) are instantiations of something else. But that’s not the case, and the freedom he loves about electronic media is unmooring youth from the concrete aspects of the world so that electronic media and the people who learn cognition from it seem to be all idea and little attachment or understanding of the underpining reality of concrete things that drive that world of ideas. Maybe the reprinted advertisement for developing a powerful memory on page 115 or the picture of a face stretched horizontally across the top 56-57 where the text is printed upside down in the book refute me on this. It’s an interesting, thought-provoking essay in a history-of-philosophy sort of way that calls the youth of the Boomer era to some inchoate protest and to open the doors of perception or something. Unfortunately, the essay is couched in a collage of images, goofy printing and design tricks that must have seemed paradigm-shattering at the time (and perhaps reinforced the message, again, at the time) that detract from the staying power of the volume. 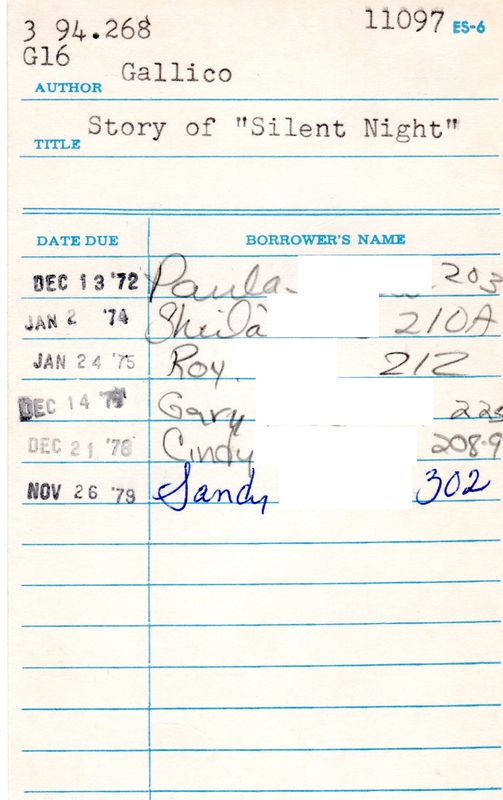 Either nobody borrowed it, the book was remaindered after a card had been filled up and before anyone else borrowed it, or the book was immediately stolen by a teenaged boy. Director of Public Works David Miller has worked for the City of Branson for 25 years. The entire time, he said, the tourist destination in the rolling mountains of the Ozarks has been looking to alleviate the gridlock that can develop on Highway 76, the theater-studded Branson strip. As a result, the panacea has long been seen as something off the ground. A monorail has been floated multiple times. “Personal Rapid Transit,” a system of individual automated cars moving along elevated tracks, has been proposed. But funding remained elusive, and projects never got past the concept stage. Now, a new Missouri-based company has proposed a gondola line — think ski lift, not Venice. At a Branson Board of Aldermen study session on Thursday, American Gondola pitched an approximately 8.5-mile route from Branson Landing to Silver Dollar City, with stops along the way, at a Branson Board of Aldermen study session. Total project cost has been estimated at $130 million. $130 million for a single-route bit of annual maintenance cost nightmare that won’t be used in rain or winter and will be vulnerable to acts of nature? That’s an idea only the people who would get paid and the twenty-three-year-olds fresh from all-night college brainstorming sessions could love. Hopefully, the responsible people who govern wouldn’t agree, but I think we’re far beyond responsible people governing at this point. Maybe the city of Branson can pay per passenger like it does on that boondoggle of an airport it has. Man, I’ve got to wonder how much of the paper’s reporting budget goes for weekly runs to Colorado for, uh, research. 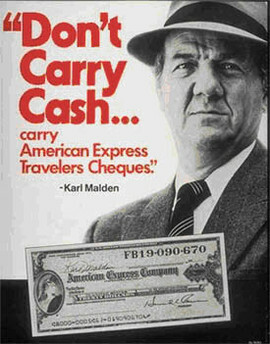 I remember a long time ago when newspapers dug up and exposed government boondoggles and waste instead of promoting it. And this is why I don’t get a Springfield News-Leader more often. I even refuse free copies when they’re handing them out at the warehouse club or supermarket. They’re not worth the couple of minutes it takes to flip through the 24 pages. This book was written by a Palm Beach Post columnist and illustrated by a cartoonist at the same. It’s funny, but you don’t tend to think of Florida as the south probably because it was really not much but swamp and heat throughout much of our nation’s history and because it was not a big part of the Civil War (although, undoubtedly, there are Florida Civil War buffs who will testify that it really was–as many Missourians will tell you about all the firsts of the Battle of Wilson’s Creek just up on that hill over there). Although the author himself is from North Carolina, which is the most north you can be in the south. At any rate, the small book is mildly amusing; it’s written in glossary style from Ah to Zat. If you liked Jeff Foxworthy twenty years later, you’ll like this book. A lot of his schtick and even a bit of his about how Southerners talk mirror its content, but I guess that would have to be the case with Southern comedians with accents. You never hear about comedians from Wisconsin and Minnesota doing bits about the northern accent, do you? I don’t. 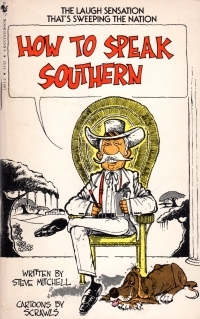 The book was a bit educational, too, as it explains the etimology of the phrase spittin’ image, which is a corruption, pardon me, Southerners, correction of “spirit and image.” I see, that makes sense. At any rate, I got this as part of a bundle I bought last Thursday, and I was so eager to look through the titles within that I put on a meaningless football game just so I could flip through books during it. So it’s not a bad waste of 30 minutes unlike some of the things I flip through. On Saturday morning, my boys and I went to a couple of book sales, and late Saturday afternoon, a birthday party sugared my children to approximately 62,000 Hz. (My scientific studies have shown that a lot of sugar can make children very high pitched, no amount of sugar can actually render them too high pitched for me to hear. Unfortunately.) Once they hit that peak, the time was right to go somewhere where they could easily get bored: The Friends of the Springfield-Greene County Library book sale. It was half-priced day, so I focused on the books (but there were some albums in the Better Books section, so I bought some of them, too). Several books on painting to browse during football games, including collections of Matisse, Manet, Toulouse-Lautrec, and William Blake. A Teaching Company course on Chinese History and a course on Mozart ($15 and $5 respectively because they’re priced per binder, and one is in library binders that allow you to check out a couple discs at once instead of the whole series). A couple of graphic novels featuring the White Knight (?) and DC’s The Huntress. A stack of comic books; once we looked them over and the boys selected a couple of Archie comics, they were no longer bored. Growing Up a Twin by a local author. A Classics Club edition of Old Goriot. I didn’t think I have it. I looked at the spreadsheet of my collection, and it says I don’t have it. 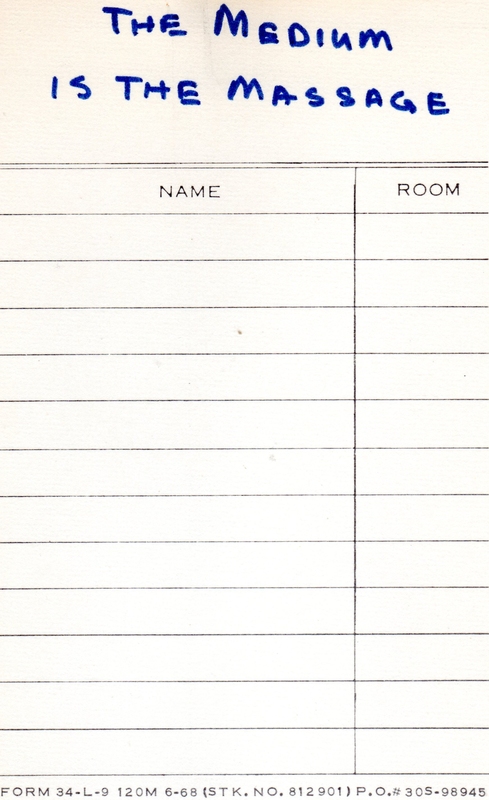 I haven’t checked the physical inventory yet, and I suspect I’ll learn that the spreadsheet is out-of-date. After America by Mark Steyn. Miracle in the Ozarks by Chester Funkhouser. T.S. Eliot by Harold Bloom. Mom at War, a retrospective of women at war. Together, a two record set by Steve Lawrence and Eydie Gorme. The Christmas Album by Herb Alpert and the Tijuana Brass. Although my beautiful wife gave this to me for Christmas last year, I also have a copy for the record player upstairs now. Six Presidents Speak, a collection of presidential speeches, I think. I have a couple more, but I’ve mixed them in with the ones I bought on Thursday. Even at half off it was a pretty big bill. Looking at the list, I have to wonder how much each individual comic book was listed. A couple bucks each, maybe. Oh, well, I will get my money’s worth in enjoyment, and it’s for a good cause. The Thrillest picks correctly for Missouri in its listing of the best doughnut shops in each state. For Missouri, it picks the Donut Stop on Lemay Ferry Road (at the intersection of Telegraph and Lemay Ferry Road). I’ve eaten many doughnuts from that place, as it was right down the road from my sainted mother’s house, and she’d often pick up a couple for us on Sunday mornings when I’d come to visit. So yesterday morning, I played hooky from the dojo to go to the Friends of the Clever Library Book Sale down in the fire station in Clever. I had a spot of trouble finding it because they put up a new Walmart Neighborhood Market in front of it which hid the fire station from view as I came west along Highway 14. But I got there. It was a smaller sale than usual with about a table less worth of material, but I found a couple books there. 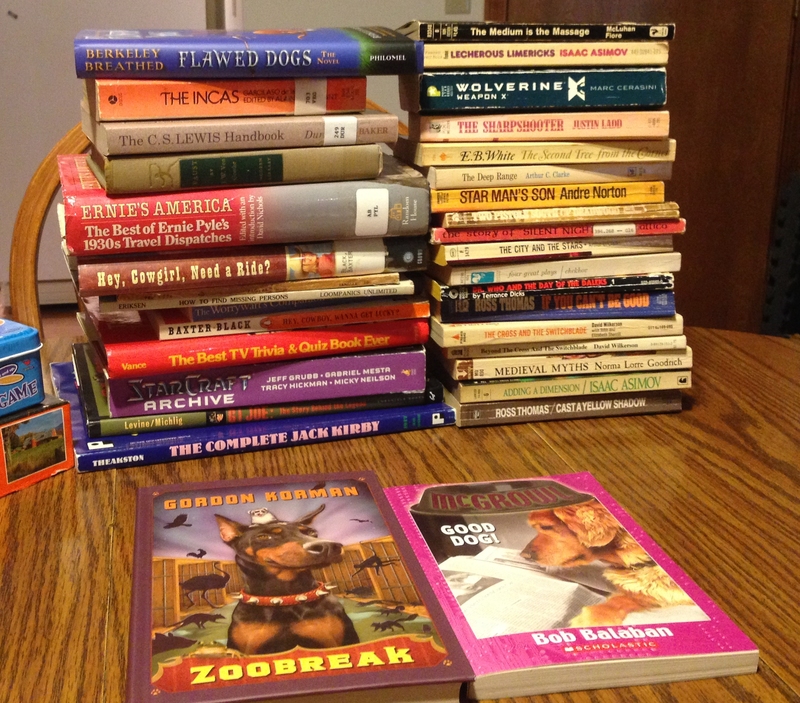 It looked like an English teacher from the 1960s might have divested of books, as there were a collection of pre-Cliff Notes summaries and surveys of books, a lot of classics in paperback, and some related literaria and teacheraria. Additionally, as we were driving to a park in Republic, we happened upon the Relay for Life fundraiser sale at Hope Lutheran Church. I didn’t see that it was going to be this weekend, but there it was. It had more books than usual and several boxes’ worth of direct-to-video slasher and horror movies. I think that’s a plea for help from someone who gets the counseling he or she needs. The Cross and the Switchblade and Beyond the Cross and the Switchblade, two books about being a priest at a church in a bad part of town. 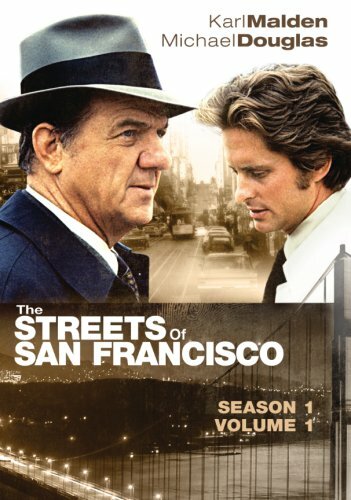 This was a genre of television for a while if I remember, and the first title was made into a movie starring Pat Boone. I know because the sale had two copies, and I opted for the movie tie-in edition with full color photos. Two humorous western novels, Hey, Cowgirl, Need a Ride and Hey, Cowboy, Wanna Get Lucky? by Baxter Black. The Republic Monitor used to run a newspaper column by him, I think. Two by Isaac Asimov, Lecherous Limericks and Adding a Dimension. The Deep Range by Arthur C. Clarke. I don’t particularly like Clarke, but last night, while volunteering at the localer Friends of the Library Sale, I saw someone with a stack of Clarke paperbacks, and I guess I’m easily influenced. A book of Jack Kirby’s work from the late 1940s before he went to Marvel. GI Joe: The Story Behind the Legend which is about the toy and not part of the fictional canon. Flawed Dogs, Berkeley Breathed’s young adult novel. Note this is in my stack, not the young young adults’. The Incas, a history of the Incas appropriately enough. Ernie’s America, a collection of travel columns by Ernie Pyle from before his writing in World War II. How to Find Missing Persons. Probably from the pre-Internet age. The Best TV and Trivia Quiz Book Ever. I hope I fare better than the The TV Theme Song Trivia Book. The Starcraft Archive, a collection of StarCraft fiction. 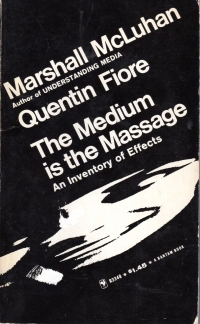 The Medium is the Massage (not a typo) by Marshall McLuhan and Quentin Fiore. Wolverine: Weapon X, a novel. A couple westerns, Two Pistols South of Bradwood and The Sharpshooter. Both from different series old enough to not have a lot of boom chocka chocka. E.B. White’s The Second Tree from the Corner. Four great plays by Checkov. Andre Norton’s The Starman’s Son. Probably not related to the Starman television series. Doctor Who and the Day of the Daleks, one of the old Dr. Who books from the 1980s. Two Ross Thomas novels, Cast a Yellow Shadow and If You Can’t Be Good. A book about medieval myths. The Joplin Globe reports that Wilson’s sister, Barbara Cole, and her husband, Gary, went to see Wilson in June about selling jointing owned property near Miller. Gary Cole said that as his wife approached, Wilson rolled a large, round hay bale off the trailer, and it almost hit her. Cole said Wilson then drove the dual spears of the hay-fork loader through the windshield of the couple’s pickup truck and chased them. No one was hurt. I was just in Mount Vernon a week ago, as a matter of fact. 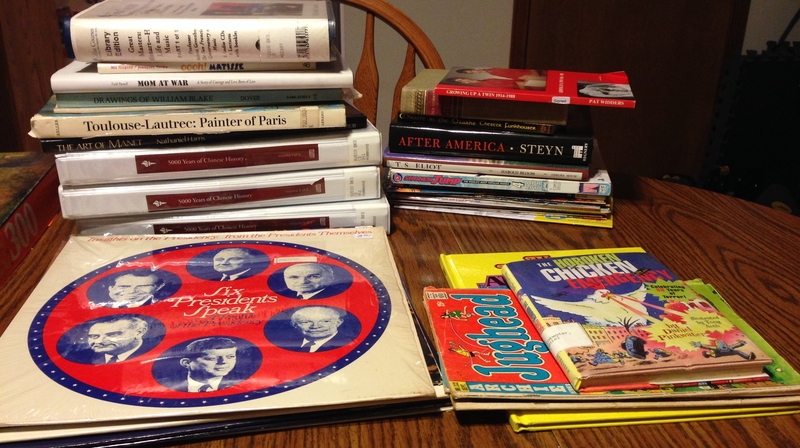 So I snuck off to the Friends of the Springfield-Greene County Library Book Sale on Thursday to raid the LPs. Jackie Gleason Presents A Taste of Brass for Lovers Only ? Dresden State Orchestra Wagner Overtures ? All the LPs were a buck each; the thumbnail values above are courtesy of Discogs. They’re a quick lookup, represent what others are selling the items for and not what people will pay for them, and in no way shape or form should be used in tallying my personal wealth. Still, Discogs leads me to believe I might have come out with $40 more value than I spent. Of course, they’ll give me hours of enjoyment so it’s more than that. 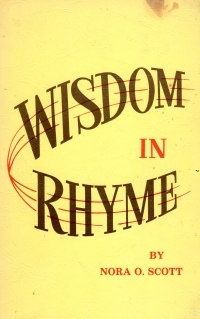 I also picked up a couple dollar books on the way by: A short bio sketch of H.G. 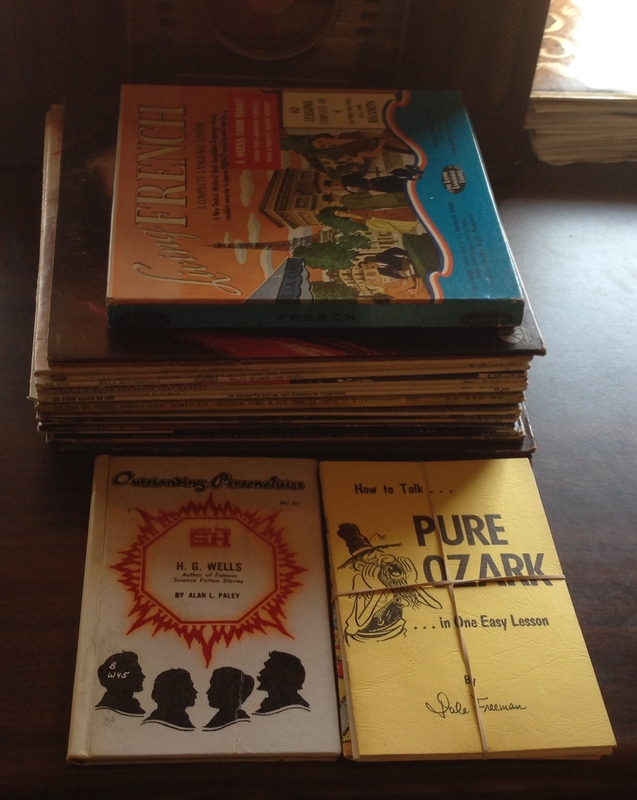 Wells and a dollar collection of chapbooks grouped about their common theme of humorous accents. No doubt you’ll see some of them reported on biemby. I don’t know if I’ll hit the Better Books section of the sale on half price day (Saturday) or bag day (Sunday). It’ll have to depend upon how flush I’m feeling on the weekend and how the scheduling shakes out. But I notice that the Friends group has wisely scheduled bag day on the Packers’ bye week. Do they know me or what? I received this book as a gift at my mother-in-law’s birthday party. She was giving away things which came with a request; in this case, I got this book and information about the George Washingont Carver National Monument just south of Joplin, Missouri, and a request that I take my children there this summer. So I started reading this book in the beginning of August, and I took my children to the historical site as requested, but the book sort of fell to the bottom of the stack on my side table. The book itself is a young adult faith-based biography of the plant doctor. As such, its chapters are short and punchy and it features a lot of Carver talking to God or reflecting on scripture. 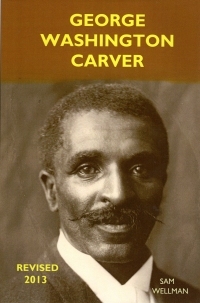 As Carver was a devout Christian and often lead prayer groups in his various colleges, it’s probably not out of place, but I’m sure there are plenty of 21st century readers who would take issue with it. If you’re such, this is not the biography for you. But as a young adult book, it’s probably a good starter and high level overview. I won’t recount the fascinating life of the fellow who was born a slave, lived in southwest Missouri during the aftermath of the Civil War, and became an artist before going to school for biology and agriculture. I will, however, note that he walked all over Missouri and Kansas to find a better life for himself and to take advantage of various opportunities and that he did all this and homesteaded for a couple of years in Kansas before going to the university. He did a lot before he was thirty and then his life and fame took off. That is what fascinates me: how self-reliant young people were in the ninteenth century. I can even tell tales about my father hopping a train with a gun at thirteen to go hunting in northern Wisconsin, but it’s so far from my late twentieth century urban childhood that I cannot imagine that sort of thing without reading about people who actually did it. Socrates, what if the user invents a time machine, travels to the past, and dies in the past? Does the soul transmigrate to a new body in the past or in the “present” where the man invented the time machine? If it’s the past, is it possible for the soul to transmigrate to the same body, creating an infinite loop? If I were tugging on his sleeve, Socrates might have tried hemlock on his own. I remember this book being mentioned explicitly (well, not that explicitly) in George Carlin’s comedy routine in his album What Am I Doing In New Jersey?. The bit is the driver behind him has his high beams on, and Carlin says that’s great because he just happens to have his copy of this book with him. At any rate, it’s taken me a long time since listening to that bit over and over on my monthly trips back from Missouri to Milwaukee right after I graduated the university, but I finally read this book (although, in my defense, I only got it last year). The book is the story of a son of one of the few remaining Saxons in post-Norman Conquest England returning home from the Crusades. His father has disinherited him for supporting the Norman king (Richard II). 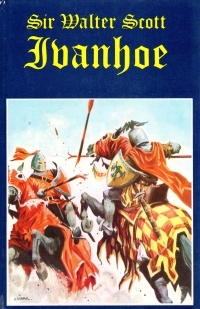 He helps a Jewish moneylender and merchant and, as a reward, gets armor and a horse so he can enter a tournament, wherein he beats the best of the Normans along with the Black Knight. A Templar is smitten with the daughter of the money lender, and…. Well, there are some nefarious plots afoot, and it involves Prince John and Richard II. Of course, if the story takes place during the time of Robin Hood, one expects Robin Hood to appear. So he does, but he remains a secondary figure. As I was reading, I confused Sir Walter Scott with Sir Walter Raleigh, so I thought the book was written 200 years before it was; as such, I was very impressed with the treatment of the Jews within the text. Although the characters curse the Jews, they’re treated well by others and are not the villains of the piece; the Normans and some of the clergy are. A bit of post-reading research (I read the Wikipedia entry) put the book in its proper historical context. Still, in the 21st century, I can see collegiate English papers beginning with the thesis that the book is anti-Semitic (at least until the researcher gets to the Wikipedia entry). Or maybe not. At any rate, it’s not a bad read. It’s in relatively modern English, although the style is a little more florid than modern readers expect (see also Frankenstein). However, it’s still only 212 pages. How do modern thrillers get three times that large without florid prose? I’d tell you, but I don’t read much modern stuff. 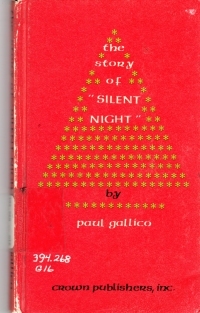 And the edition: This is a 1982 Legendary Classics edition, which means someone grabbed the public domain copy, introduced a couple of typos to protect their copyright, and printed this cheaply. The book identifies a number of others in the series (of which I’ve read only a few). But this edition is blessedly free of introductory essays explaining what you’re about to read (and throwing in spoilers) before you get to the actual novel. My goodness, the middle-of-the-twentieth-century editions of classics are worth more than the modern Penguin editions just for the freedom from interruption and pretension of telling you what you should think about what you haven’t even read yet. So if medieval romances are your thing, this might be the book for you. I certainly recommend the edition. I try so hard to be funny, but. 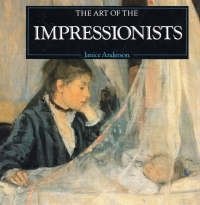 This book is a quick little sampler of Impressionist and sort-of impressionist paintings. It gives a bit of text describing the history of the Impressionist movement and then goes to the images. The book covers painters like Monet and Renoir, but also other people who exhibited with them, including van Gogh, Vuillard, Morisot, Cassatt, Gaugin, Gonzales, Sisley, Cezanne, Bazille, and others. As a matter of fact, the book gives a little more weight to the other painters as opposed to Monet and Renoir. It shows a lot of breadth and variation in the school–and the nearby styles–so it’s a touch more educational than some of the other Impressionist picture books I’ve looked through (see also Treasures of Impressionism and Post-Impressionism and The Impressionists). But I still like Renoir the best, although my beautiful wife might someday convince me to decorate our home in something other than Renoir prints. Spell check, why you so crazy? 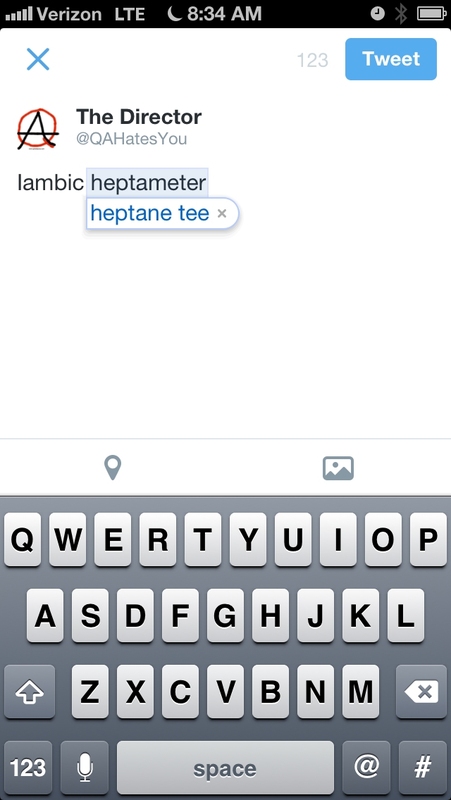 Why would I be talking about a tee shirt featuring heptane instead of a poetical line of seven feet. This is definitely a case of bias: thinking that an iPhone user would more likely be a chemical engineer than a poet. 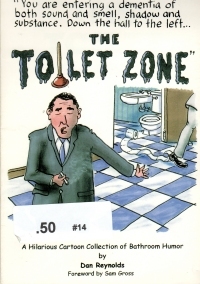 This book is pretty much what you would expect from the title: toilet humor. It’s a collection of cartoons featuring toilets and bathrooms for the punchlines. Heaven help me for buying it, but I did; not only that, but I chuckled at some of them because some of them are more clever than modern sitcoms. Even my beautiful wife, who does not like scatalogical humor at all, snickered at one or two of the cleaner jokes amongst them. So this is worth the price, which in my case was probably a quarter. And no doubt it will keep my boys entertained for a far longer time than an adult would enjoy the book.